November is the month for thankfulness. But it shouldn’t stop there. Barbara Rainey, wife of Dennis Rainey and creator of the Ever Thine Home® line of resources, encourages listeners to practice thankfulness all year long. 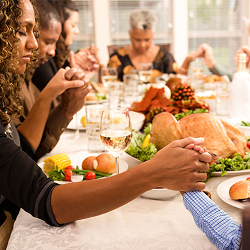 Barbara recalls how she and Dennis prompted their own children to be thankful by initiating mealtime prayers, learning Scripture songs, and writing thank you notes to those who had blessed them. After graduating from the University of Arkansas with a Bachelor of Arts degree in history, Barbara joined the staff of Campus Crusade for Christ in 1971. Her husband, Dennis, whom she married in 1972, is the President of FamilyLife, a ministry of Campus Crusade that is headquartered in Little Rock, Arkansas. You can read more about Barbara’s work at EverThineHome.com.